Open the workbook Shutoff Valve Spring Force. 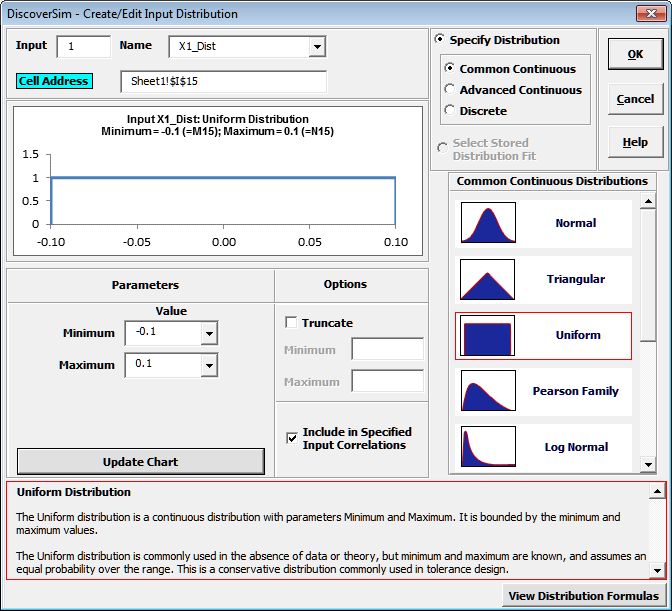 DiscoverSim Input Distributions will simulate the variability in feature tolerance. We will use the Uniform Distribution, since we do not have historical data to estimate a best fit distribution, and will assume an equal probability for a feature to have a minimum tolerance or maximum tolerance value. 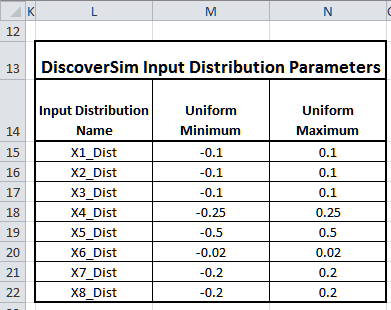 Input Distributions with Uniform Distributions (Random) will be specified in cells I15 to I22. Nominal (midpoint) values are specified in cells H15 to H22 with initial values determined by engineering best estimate. Input Controls will be applied here for optimization. The sum of Nominal + Random are used to calculate the X1 to X8 variables and given in cells J15 to J22. 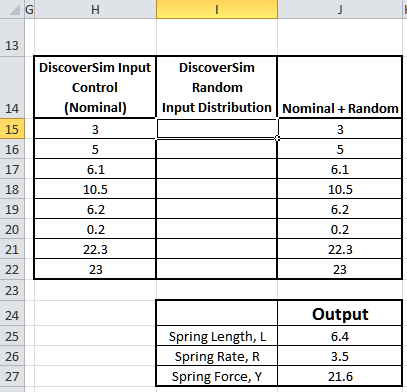 The output, Spring Rate, will be specified at cell J27 using the formula given above. Click input Name cell reference and specify cell L15 containing the input name “X1_Dist”. After specifying a cell reference, the dropdown symbol changes from to . 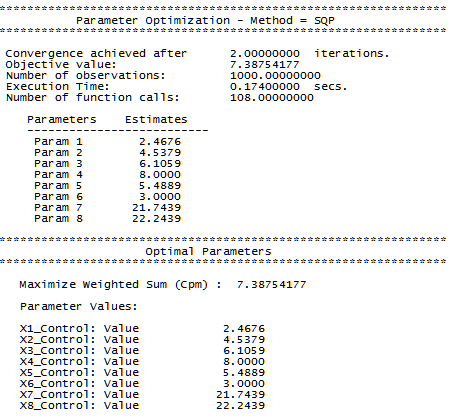 Click the Minimum parameter cell reference and specify cell M15 containing the minimum parameter value = -0.1. 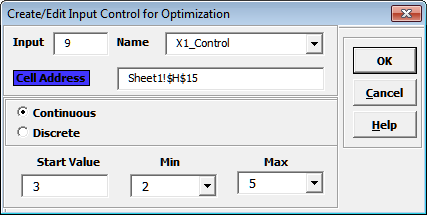 Click the Maximum parameter cell reference and specify cell N15 containing the maximum parameter value = 0.1. Click on cell I15. Click the DiscoverSim Copy Cell menu button (Do not use Excel’s Copy – it will not work!). Select cells I16:I22. Click the DiscoverSim Paste Cell menu button (Do not use Excel’s Paste – it will not work!). Note: The cell contains the Excel formula for Spring Force: =_X7 + _R * (_X5 - _L). Excel range names _X7, _R, _X5 and _L are used rather than cell addresses to simplify interpretation. 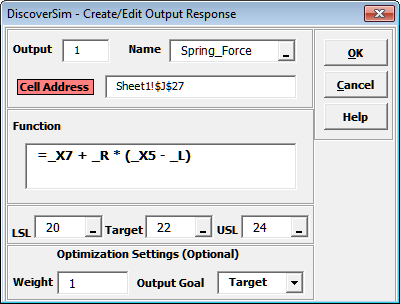 Enter the output Name as “Spring_Force”. Enter the Lower Specification Limit (LSL) as 20, Target as 22, and Upper Specification Limit (USL) as 24. Hover the cursor on cell J27 to view the DiscoverSim Output information. 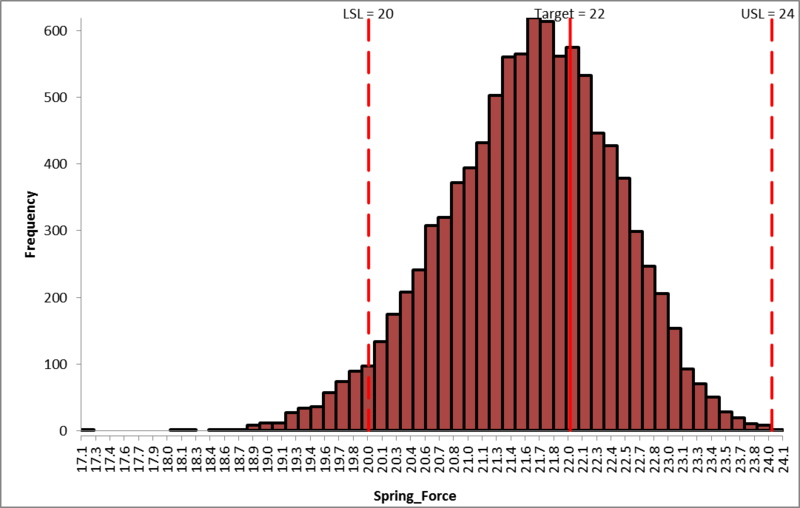 From the histogram and capability report we see that the Spring Force is not capable of meeting the specification requirements. The process mean is off target and the variation due to feature tolerance is unacceptably large. Approximately 12.5% of the shutoff valves would fail, so we must improve this design to center the mean and reduce the variation. X5 (Initial Compression) is the dominant input factor affecting Spring Force, followed by X4 (Spring Gap Depth). The tolerance on Initial Compression is +/- 0.5. Discussing this with our supplier it turns out that the tolerance for this spring feature can be tightened to +/- 0.25 without increasing the cost. This Sensitivity Chart uses the Spearman Rank Correlation, and the results may be positive or negative. 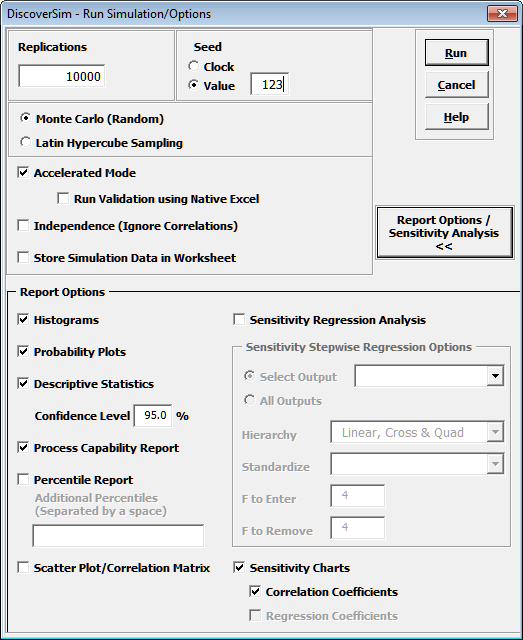 If you wish to view R-Squared percent contribution to variation, rerun the simulation with Sensitivity Regression Analysis and Sensitivity Charts, Regression Coefficients checked. Select Sheet1, click on cell M19. Change the Uniform Minimum value from -0.5 to -0.25. Click on cell N19. 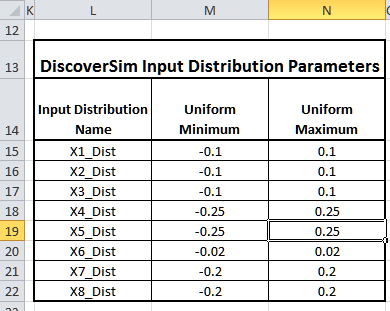 Change the Uniform Maximum value from 0.5 to 0.25. 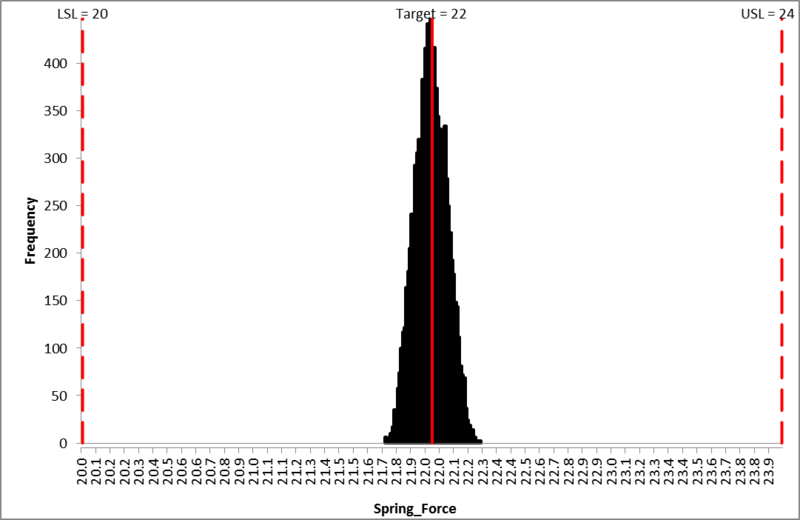 Tightening the tolerance of X5, Initial Compression resulted in an improvement with the Spring Force standard deviation reduced from 1.24 to 0.86, actual percent out of specification from 12.5 to 4.0% and Ppk increased from .43 to .62. However a Six Sigma design should have a minimum Ppk value of 1.5. At this point one could use Excel’s Solver to further improve the process by finding the nominal values that center the mean, but that still would not achieve the desired quality level. 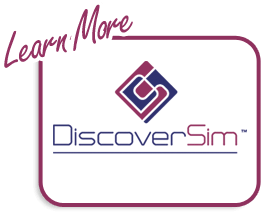 DiscoverSim’s Stochastic Global Optimization will not only find the optimum X settings that result in the best mean spring force value, it will also look for a solution that will reduce the standard deviation. Stochastic optimization looks for a minimum or maximum that is robust to variation in X, thus reducing the transmitted variation in Y. 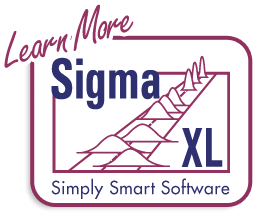 This is referred to as “Robust Parameter Design” in Design For Six Sigma (DFSS). The controls will vary the nominal X values in H15 to H22. The nominal values are added to the random input distribution (J15 to J22) as discussed above in Step 1. Constraints will also be added as shown so that there can be no overlap due to tolerance. For example if X2, Height, was at the low end of its tolerance and X1, Lip Height, was at the high end of its tolerance, it is possible that an overlap would leave no place for the spring to be seated. Click input Name cell reference and specify cell P15 containing the input control name “X1_Control”. Click the Min value cell reference and specify cell Q15 containing the minimum optimization boundary value = 2. Click on cell H15. Click the DiscoverSim Copy Cell menu button (Do not use Excel’s Copy – it will not work!). Select cells H16:H22. Click the DiscoverSim Paste Cell menu button (Do not use Excel’s Paste – it will not work!). Review the input control comments in cells H16 to H22. Type X2_Control – X1_Control in the “Left Hand Side” (LHS). Select “Greater Than >”. Enter 0.2 in the “Right Hand Side” (RHS). Click OK. Review the comment at cell U16. The cell display is “TRUE” since the initial value for X2_Control (5) is greater than the initial value for X1_Control (3). Maximize Cpm is used here, rather than Ppk, because it incorporates a penalty for mean deviation from target. We want the spring force mean to be on target with minimal variation. Note, however, that this solution may not produce the lowest possible standard deviation. We will use the Hybrid optimization method which requires more time to compute, but is very powerful to solve complex optimization problems. 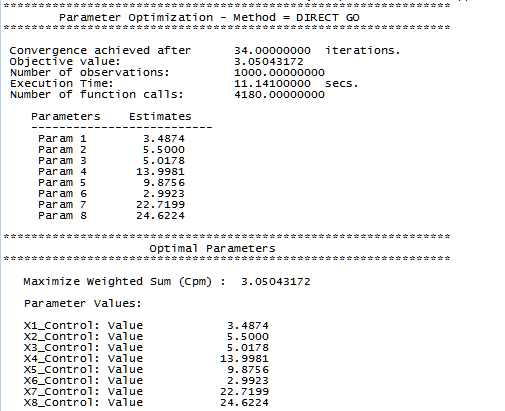 The second method in Hybrid, Genetic Algorithm global optimization, used the above optimal values as a starting point and found a solution that resulted in an astonishing Cpm value of 7.38! 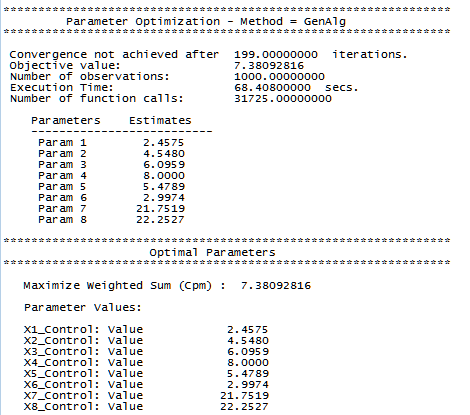 The final method in Hybrid, Sequential Quadratic Programming local optimization, used the above optimal values as a starting point and improved the solution slightly to a Cpm value of 7.39. Note: The constraint cell values in Excel will all appear as TRUE at the optimum. 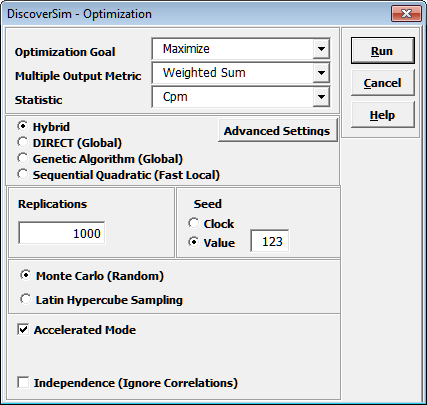 Select Run Simulation. Click Run. The slight discrepancy in predicted Cpm (Optimization 7.39 versus Simulation 7.29 is due to the difference in number of replications for Optimization (1000) versus Simulation (10,000). Standard Deviation reduced from 1.24 to 0.09, more than a ten-fold reduction! Ppk increased from 0.43 to 7.29, Cpm increased from 0.51 to 7.29! Actual % Total (out of spec) reduced from 12.5% to 0%! The benefits do not stop here. Since the design is now so robust, we can review the input tolerances to see if there is a cost saving opportunity by widening the feature tolerances, and re-running the simulation to study the impact. Finally the results predicted here should be validated with physical prototypes before proceeding to finalize the design parameters. Remember “All models are wrong, some are useful!” George Box.